Dec ah. V cold n rainy at times. 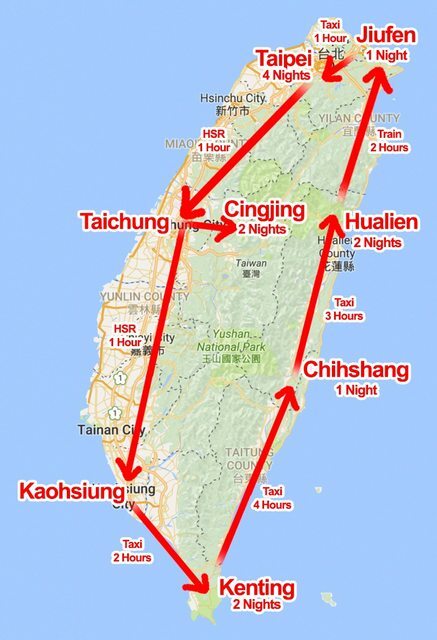 16 days to cover whole Taiwan is likely just touch and go, spending most time on the road. Dunno if you're there to enjoy or just going on a road trip to clock miles. I'd suggest to spend the days on the northern part Taiwan. [QUOTE=luei74;107669415]So far don't have yet, still read up some blogs and get more idea, more like following the below route. Is the below route sounds feasible? 4 person unless you driving lor. December go Kenting? Have you researched on Kenting/Hengchun? You want to swim in the cold? Kenting is better known for the beaches. Never a fan of beitou. any recommendation for Tea at Alisan? I'm here but im not a tea person so dunno which to get.